May contain spoilers for books 1-3 of Air Awakens. Vhalla has left the confines of the Solaris army and has now set off on her own. She finds herself on the crossroads; quite literally and metaphorically. For once in her life, Vhalla is free to make her own choices. Having separated from Prince Aldrik, she no longer finds herself under the reigns of the Emperor. However, she carries a sacred weapon alongside her. Achel, one of the last known crystal weapons known to man has come into her possession. It is her job to make sure the axe lands in the safe hands of Victor who runs the sorcerer's tower in the capital. However, her past awaits her in the capital. To return home is to return to Aldrik, the very man who broke her heart. Her journey back will not be easy. Multiple foes will do everything in their power to make sure Vhalla never reaches the tower, even if it means killing the last Windwalker. Unbeknownst to Vhalla, her mission will be fraught with dangers from all sides. The people she trusts the most, may very well be the ones who mean her the most harm. Having left the third book in the Air Awakens series feeling disappointed I was nervous coming into Water's Wrath. I had no idea where the story would be taken, or how the characters will have changed. That being said, I still quickly requested an ARC as I needed to know that the story I came to love still had some of that same magic that made me fall in love with it in the first place. I am so relieved and happy to report that Water's Wrath was in fact a improvement from its predecessor, Earth's End. I still don't think it beat out books one and two, but it was still a great installment. I was strangely so happy to have Vhalla away from Aldrik for a huge chunk of the book. Don't get me wrong, I love these two. I ship them to Saturn and back. But in the third book I found them to be a bit much if you will, which in all honestly hurt my appreciation for the book. This way, we got to see Vhalla without her prince, therefore we got to experience her growth without it being overshadowed by frolicking and sweet promises. Sometime romance gets in the way of things, you know? Vhalla did grow. She no longer feels like a girl to me, but a woman. No longer does she allow herself to be chained to the will of the Solaris Empire - nor be a pawn in anyone else's vendettas. It was so refreshing to see the Windwalker become something truly magnificent on her own. I think that was one of my favorite bits about this story is the molding that goes into not just the main characters, but also the secondary characters (which were largely relevant in this book). Fritz is one of my favorite characters, he's a Water sorcerer and idk their powers are kickass and just remind me of Avatar. That being said, when Vhalla and Aldrik did meet up again, I was ecstatic to see the slow burn return. I really think book three was all gushy love. It really was. But Elise carved something touching this time around. The romance was frantic, alluring and dangerous. I found myself fangirling the hell out whenever Aldrik and Vhalla were near one another because it was forbidden. The chemistry was perfect and their dialogue actually fit. I loved it. I loved them so so much! The plot was really alive and unpredictable. I could see a few things coming, but in a general sense I was blindsided by a few things. There's a few scenes in there that totally wrecked me. I got really choked up as Elise writes such fantastic interactions between her characters that it's impossible not to get attached. The only thing I have to say that poorly reflects upon Water's Wrath was that I think it was rushed. Especially the ending. I didn't like how it was all very convenient (shocking nonetheless) but I would have enjoyed a slower paced buildup to what happens in the end. I was pleasantly surprised and grateful that Water's Wrath returned to what I found so great about it. This is the fourth book in the series with only one more to go. There characters, the world and the plot are rich and done so well. 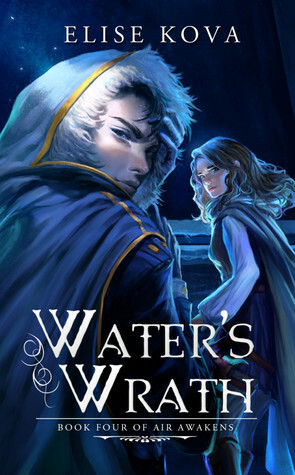 If you're a fan of YA Fantasy with a sometimes heavy dash of romance then I can't recommend this series enough. I love how I can't imagine how this story will end. I cannot wait to see how Elise Kova closes off this magical channel of a world she has created in only a years' time. Kynndra is not over Daredevil. She honestly just needs season 3 to see if her children (Frank and Karen) get together. I only read your first paragraph because you mentioned potential spoilers, but I'm glad this was better for you than the previous book, Kynn! That's always a great feeling. I'm excited to catch up on this series as it's right up my alley. Quite looking forward to how Vhalla grows and learns with out the shadow of the solaris empire and a certain dark prince but as well as that I want to see how Aldrik deals with every thing, does he grow as a person? and I'm curious how the stories from tales from the front intertwines with everything as well; totally feel like there are secret plans in motion right now. Beyond excited for these books!!! I did forget to mention him didn't I? Aldrik also grows tremendously from when he originally started to where he's at now. He'll have a lot of responsibility in the next book, I'm looking forward to seeing how he deals with it. I still have to read Tales from the Front (I'm terrible at keeping track of novellas). So many secret plans! That's great that this installment pulled through for you. This looks like such an exciting series. Hmm. I'm not really sure, Joy. It really depends on what aspect of the fantasy genre keeps you from not reading it. It's a pretty light fantasy if you ask me, so I imagine it would be alright. But I can't be sure. I love this series and how it's progressed so far, but I agree that the romance in the third book seemed pushed onto us a little too much. I'm excited to read the next installment, though, and find out what Vhalla's like without Aldrick constantly around her. Is she stronger? Does she have more conviction? What happens to her? I need to know! The third book really did have way too much mush in it if I'm honest, but I'm glad book four was better. I too cannot wait for book four! So excited to see what happens. I am so excited for the last book but... I am so, SO sad and scared that this is going to be the end. I just... I don't know what to do with myself. It's one of those situations where I will WANT to read it ASAP but then read slooowwwly hahah. Great review, I am so glad you are enjoying it again!! AHH you've read them Shannon? I'm happy you enjoyed WW more than me. It was good, but still wasn't my fav. Hopefully book five is that one. There were so many gut wrenching scenes in this book so I totally understand!